Now that the Galaxy S5 is out for sale on all the major carriers and in a couple dozen countries worldwide, the rumor mill has started for Samsung’s other big yearly release: the Galaxy Note series. Specifically we’re talking about the Galaxy Note 4 this year, as that’s likely slated to be announced and released in September as the rest of the Note series has in the past. This year looks to bring some new and very interesting twists to the device though, as we’ve seen a strong level of water-resistance and dust-resistance make its way to the Galaxy S5 and will be making its way to the Galaxy Note 4 as well. That’s not all though, as it looks like the device itself might look quite different from what we’ve seen in the past from Samsung or any other manufacturer to be specific. 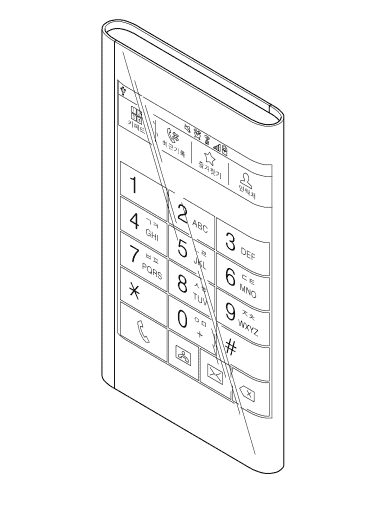 We’ve seen Samsung show off folded displays that are bent over a tapered edge of a device before, but not ones quite like what are seen in a newer patent filed by Samsung just yesterday. What we’re seeing here is a display that’s not only bent over the edges of the device like we saw in the YOUM prototype phones back in early 2012, but a display that continues onto the back of the phone a little ways too. Essentially it looks like Samsung is planning some sort of device with a display that wraps where your fingers might lay on the sides of the device near the back with shortcut buttons placed along that edge. It’s a slightly different behavior than Samsung showed off last year as one of its conferences, in which a Samsung executive showed notifications scrolling across the side of a device while it was inside of a clamshell case. We’re not sure how useful a touchscreen on the sides of a device would be, especially a device as large as the Galaxy Note series is, as you tend to palm the side when holding it one-handed, but Samsung likely has these ideas covered for a market type product. We’re expecting a foldable device with next year’s Galaxy Note 5, and this year’s Galaxy Note 4 will have a 3-sided screen, so is this the patent for the Note 4 or is it just a display concept? There’s no telling with patents sometimes, but it does show that Samsung has been working on different prototypes of these types of devices and that we’ll definitely see something similar in September. 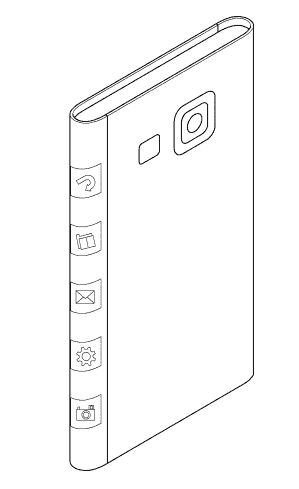 The post New Samsung Patent Shows Us What the Galaxy Note 4 Might Look Like appeared first on AndroidHeadlines.com |.